A chance to play the private Country Club of New Canaan Course while benefiting the great work of Rotary International and the fight to END POLIO NOW. 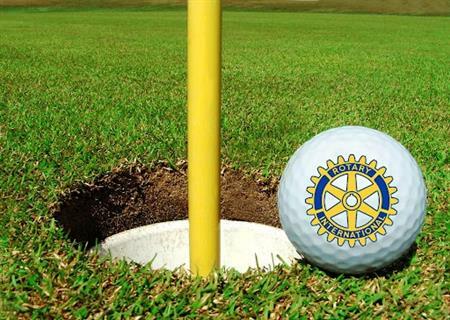 The Rotary Clubs of New Canaan, Wilton, Stamford and others will hold their 10th annual golf outing on Thursday afternoon, May 10th and we are hoping you can join us in support of a great cause. Welcome Lori Kelly, our newest member! 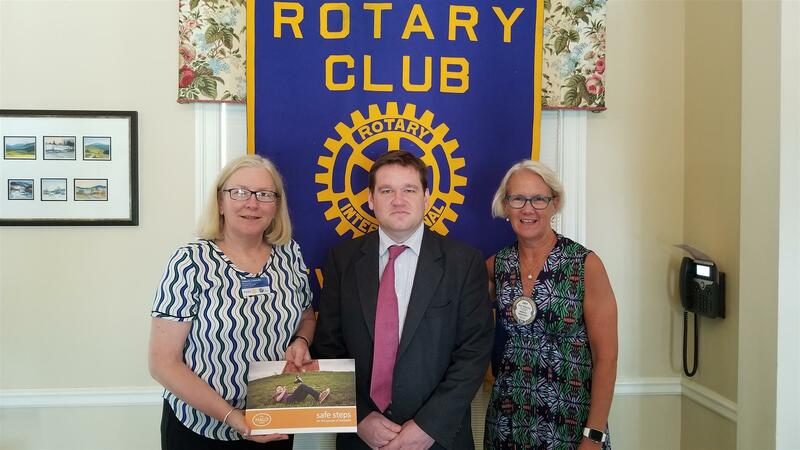 The Rotary Club of New Canaan continues to grow! 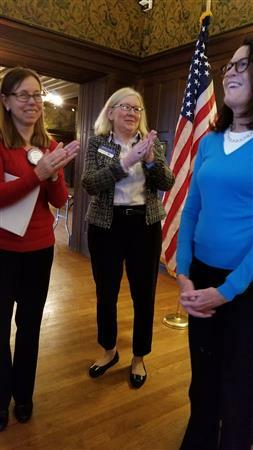 Welcome Lori Kelly, Executive Officer of the New Canaan Board of Realtors, as our newest Club Member. 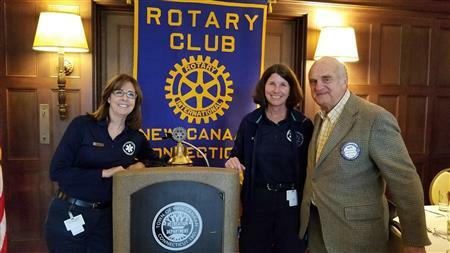 Robin Gestal and Alison Bedula, volunteers with the New Canaan Volunteer Ambulance Corps (also known as NCVAC), are joined by Rotary Club President-Elect Keith Simpson after making a very informative presentation to our members. NCVAC provides a vital service to local residents and the volunteer commitment of its members is second to none. We are incredibly fortunate to have such dedicated individuals in our midst who spend countless hours ensuring us that quality medical attention is close at hand. For a small town without a hospital, the speed and quality of response to medical needs is remarkable! 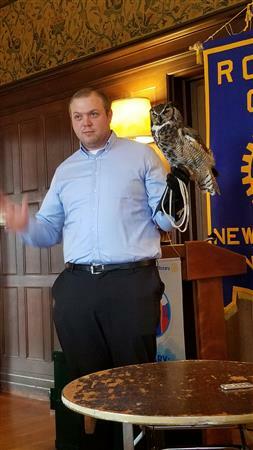 Today we enjoyed a visit from New Canaan Nature Center Executive Director Bill Flynn, to bring us up to date on “The State of the Center.” After describing a brief history of the Center and bringing us up to date on the latest news, Bill opened his mysterious green box and produced Socrates [Sox], a mature great horned owl who tolerated the audience while he explained how Sox had arrived at the Nature Center, the various types of owls, their lack of smell, their OK eyesight, their incredible hearing and their prowess as hunters. It was a fun and informative presentation! For over a decade, the Rotary Club of New Canaan has supported the International Mine Clearing efforts of the HALO Trust. On July 20, 2017, the club welcomed the HALO Trust's United States Executive Director, Adam Jasinski, to our meeting. The New Canaan Library will host a talk by Marshall Mayer entitled "From Devastation to Conservation: Rebuilding in the wake of Typhoon Haiyan" on Sunday, April 9th from 2:00-3:00pm in the Lamb Room. 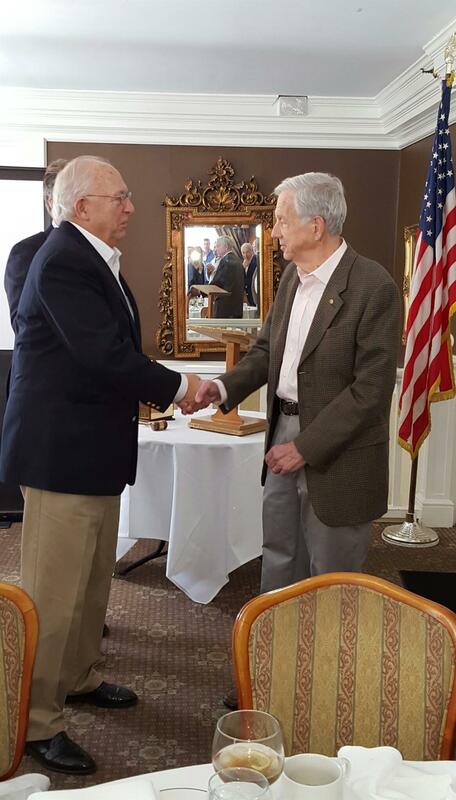 Marshall was one of the founders of Young Pioneer Disaster Response (YPDR), an organization that the Rotary Club of New Canaan helped fund with a Rotary District Matching Grant in 2014. Make plans to come learn how a few individuals can impact the world when they put their heart, soul and mind to work. CLICK HERE to learn more and register to attend. There is always a risk involved when reporting on the contributions of various individuals to a successful event that one or more people who deserve credit are not recognized. 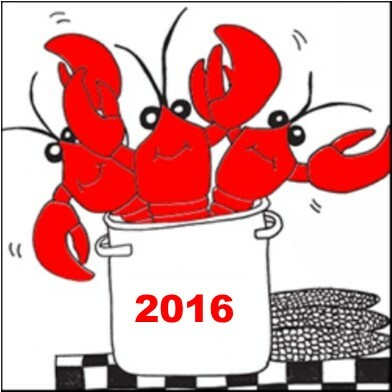 With apologies in advance to any such folks, here is your humble scrivener’s take on last weekend’s Lobsterfest. Leadership matters! Fred recruited his management team, assigned clear objectives, checked in frequently to ensure milestones were met, communicated with them clearly, and then was present virtually every minute both days on the ground dealing with whatever opportunities popped up. Right out of the Harvard Business School playbook. President 2.0 contributed in several ways. He appointed Fred. He conceived of the sponsorship model which resulted in 26 companies paying a total of $6,500 with a marginal increase in cost of only $650, and he recruited most of the sponsors. Then he brought wife Melissa and son Max to share the labor burden with the little people while he supervised from on high. While the events of the weekend are fresh in your mind, try to think of anything you personally experienced that could be improved upon, and let Fred know. No detail is too small. 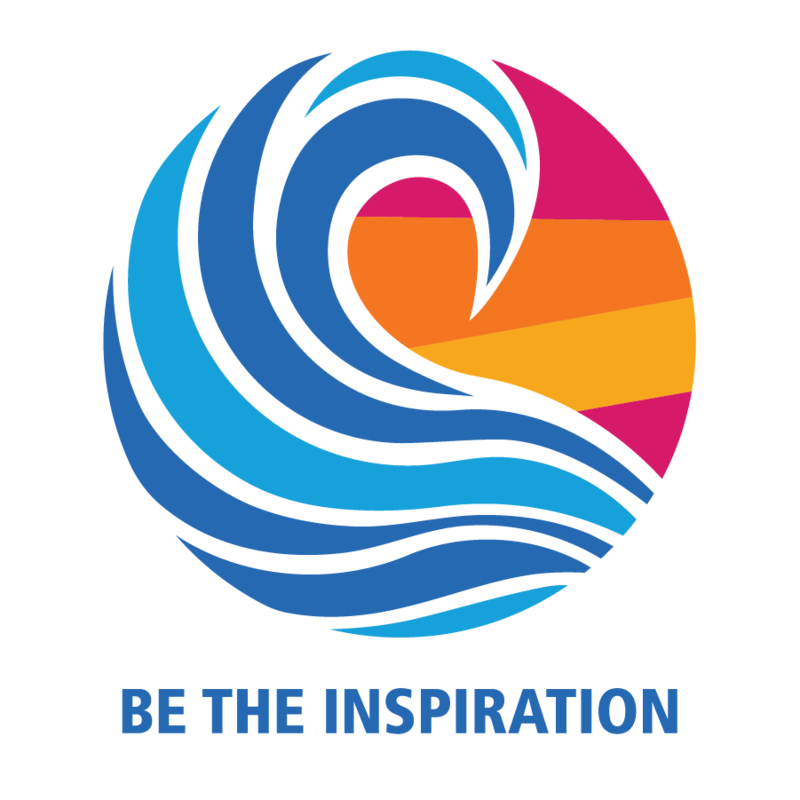 Our goal should be to improve every facet of the experience every year regardless of the success of this year’s event. More better, more money, more opportunities for service. The 2016 edition goes in the book as a wonderful success. The Year of the Bow Tie gets curiouser and curiousier. Apparently a sudden inspiration to leave New Canaan for Williamsburg overcame President 2.0 and, before he was able to arrange for a stand-in, he found himself well on his way to his destination. What to do? How about a broadcast email to the membership stating that he has abandoned his post and entreating someone, anyone, to act in loco presidentus? Sounds like a plan. Fortunately President-Elect Valerie filled the void admirably and handled the meeting management like a grizzled veteran. The 2.0 management style is certainly unique. The very first time Valerie appeared before the Club in her leadership role she correctly requested the introduction of Visiting Rotarians and guests. Virtually unprecedented. The unfortunate absence of either diminished her performance not a whit. Next year could be BIG. Joe Rucci announced that Ed Nordgaard’s memorial service will take place at the First Congregational Church of New Canaan on Saturday, August 27, 2016 at 10:00 AM. On the Lobsterfest front Fireman Fred requested a meeting of his formidable staff following the meeting, said to look out for Amy’s email sign-up sheet which should be distributed shortly [he stated the minimum commitment he is expecting will be 6 hours], and entreated the membership to sell, sell, sell. Then Ducatmeister Richard rose and informed the audience that he has received a disappointing 20% of the receipts he is ultimately expecting based on each member’s ticket allocation. If you have not as yet given Richard the check for your tickets, GET IT UP! This would be a good year to abandon our tradition of torturing anyone foolish enough to take on a position of responsibility. The Lobsterfest is our major opportunity to fund our local, District and international service initiatives for the year. Just because 2.0 isn’t here is no reason not to support him. The Exchange Committee, Ann and Alex, then reminded the audience that they have successfully completed [and passed] committee level training and that Betsy and [surprisingly] Ben had aced the host family training just in time to welcome Alvaro next week. As noted in the recent EXTRA edition of the Bullet, Alvaro will be our speaker next week. If you are in town, be there. The Committee needs an ambassador from 9:00 until 6:00 next Friday to be responsible for Alvaro – take him on a tour of the town, take him swimming, play golf, etc. If you can be that person contact Ann [anncheney23@gmail.com] or Alex [alex.e.grantcharov@gmail.com]. It is time to step up and make Alvaro feel welcome in New Canaan. Steve was enlisted to perform the sergeant duties and to no one’s surprise commenced his performance by uttering what has become his mantra, “I got nuthin’.” Contradicting that initial statement, he then launched into a golf joke that offended every distaff member of the audience, although, truth be told, it was pretty funny. Fines followed from Dr. John who was transported by the sophisticated cabaret act of George Baker at the pop-up park last evening; Fred a happy for a week in New Orleans [although August may not have been the optimum month to visit]; Rob was happy to have his son back from an academic/adventure experience in the Caribbean; Ann had a meager happy one for a week in New Hampshire; and Chris Snyder by way of B.T. had a sad because he would miss Ed Nordgaard’s infectious smile. Before retreating to his seat, Steve once again flogged the NC Chamber of Commerce golf tournament at Wee Burn on September 26th. He promised to continue hectoring the membership from now until then unless he gets some results, so discretion being the better part of valor, someone please step up. For a mere $5,000 you could be the Spieth Title Sponsor [unless Steve beats you to it]. Once again following his President’s lead, Program Chair Ken was absent, so President-Elect Valerie donned her Acting Program Chair hat and introduced the day’s speaker, our very own B.T. Bowler, NCHS Class of 1986, married with three children, Ridgefield resident, and NC based Ameriprise financial advisor for the past 22 years. His subject was the Fiduciary Rule promulgated by the federal Department of Labor, and thus known as the DOL Rule. It’s stated purpose is to make transparent to the account owner what fees or friction are associated with her account. Noble goal. In its normal efficient fashion, the federal government has managed to condense this objective into an easy to understand, crystal clear document numbering in excess of 1,000 pages. The SEC is supposed to regulate the financial services business, but in this case the Department of Labor wrote the Rule and, having no enforcement arm of its own, farmed that out to the IRS. What could possibly go wrong? B.T. stated that aggregate 401k’s and IRA’s in the U.S. total some $20 trillion dollars. Various layers of government want a piece of that money and so have been exempted from any compliance constraints placed on the private sector. There are literally thousands of broker/dealers in the country, most of which will not be able to bear the cost of compliance with the Rule and will be forced to either consolidate with the few remaining large firms or go out of business. As B.T. moved from one side of the room to the other, playing the different roles of the affected parties, the whole subject became somewhat opaque. His conclusion, if I understood it, is that the Rule is another example of enormously disruptive regulation fundamentally changing the face of financial services in the country over the next few years. When the dust settles, he opined, Registered Investor Advisor Valerie will still be standing. 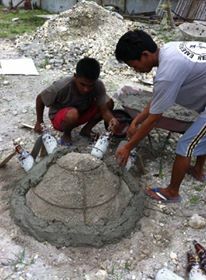 Heavy stuff! 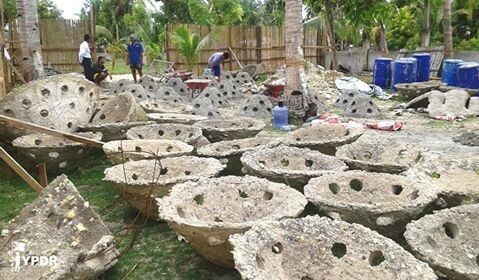 Earlier this year the New Canaan Rotary Club received a Rotary District Matching Grant for an International Service Project to help restore Marine life off the Coast of Bantayan Island in the Philippines through the work of the Young Pioneer Disaster Relief organization. Check out this video showing the effects of the first underwater 'Marine Domes' set in place to accelerate the growth of new reefs and to provide a protected home for vulnerable marine wildlife.